Ready for a special getaway in the historic coastal town of Beaufort, South Carolina? Coastal Living magazine has named Beaufort “America’s Happiest Seaside Town" and you're in luck because we have the perfect spot for your stay - a pristine guest house in the heart of the downtown district. 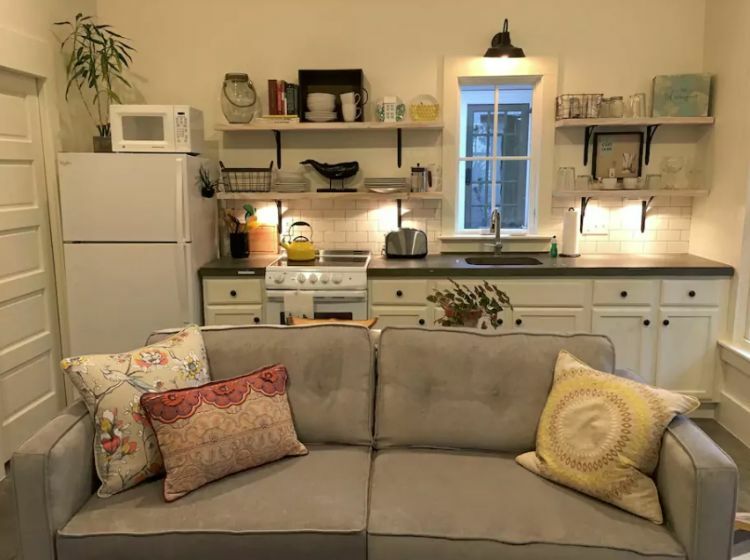 The Wren Guest House is available for vacation rental through Airbnb. It is located in the charming courtyard of a 1920s home. 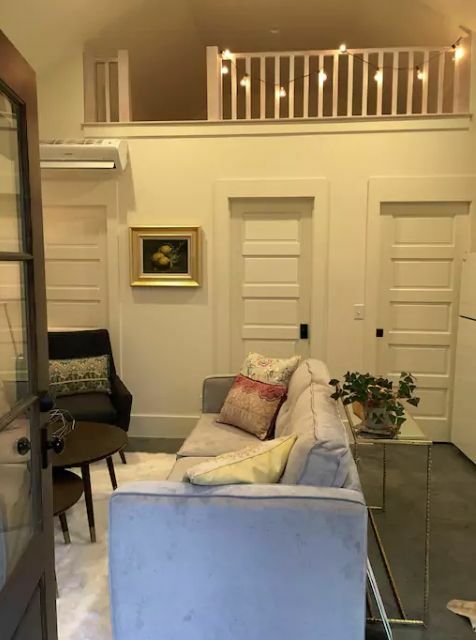 The house features an open floor plan that includes the living room and kitchen with vaulted ceilings, as well as one bedroom and an ensuite bathroom. The kitchen is part of the open space living area, located on one wall. Although small, efficient planning has made it fully functional with an oven, refrigerator and even a microwave. Classic white subway tile, white cabinets, and chic open shelving make for a beautiful and on-trend space. The entrance opens to a welcoming living room with tasteful furniture and colorful accessories. 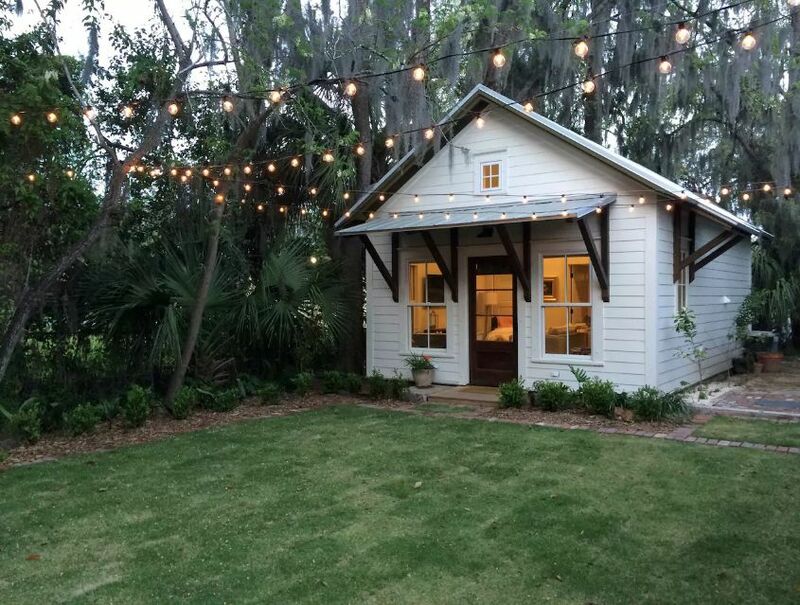 Soaring vaulted ceilings help the space feel roomy, while a storage loft adorned in string lights adds a bit of character. The living area manages to squeeze in seating, an entertainment cabinet, and a small eating area. 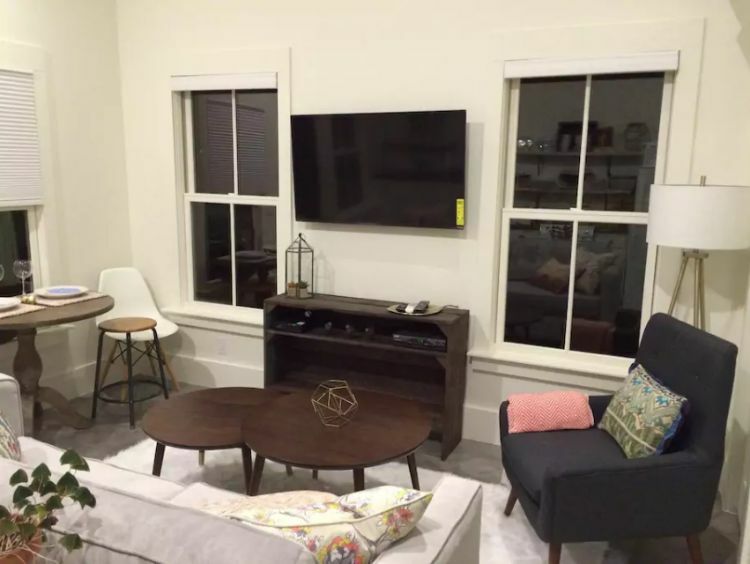 The furnishings are a mix of mid-century modern and traditional. The little dining area is the perfect spot to enjoy views of the courtyard and enjoy a glass of wine. 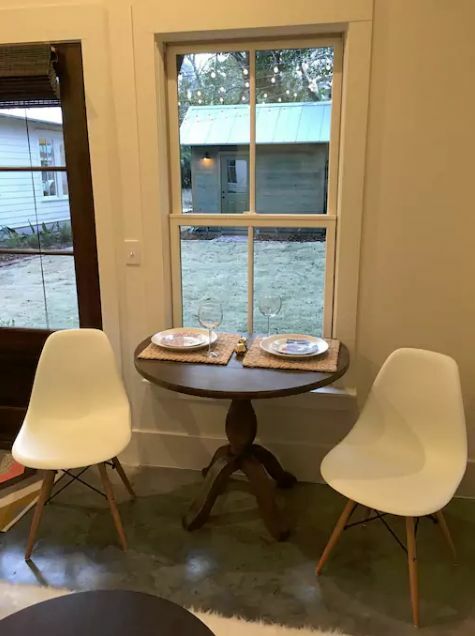 To imitate this design in your own home, try pairing modern chairs with a traditional style table for an eclectic look. 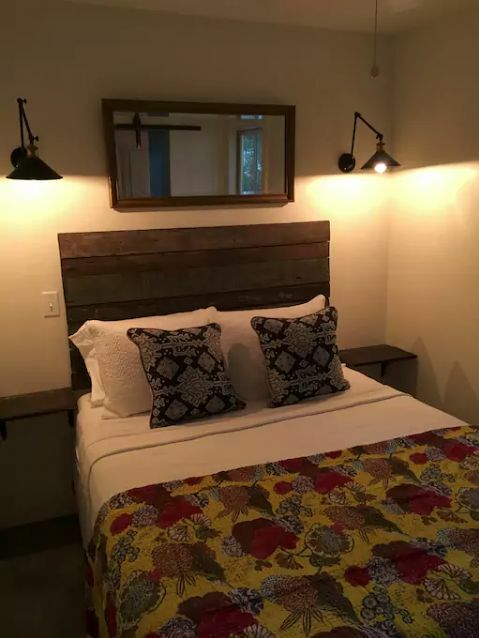 The bedroom features a custom planked wood headboard with built-in shelves in place of night stands. Space-saving wall sconces take the place of traditional bedside lamps. 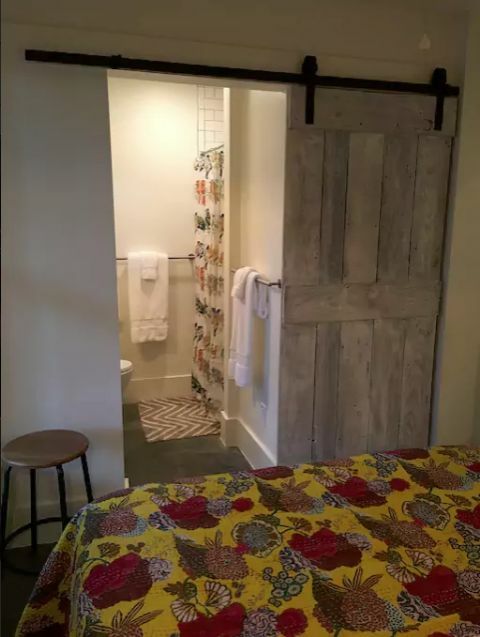 The sliding barn house door adds rustic charm in addition to saving precious floor space. Bold patterned bedding adds interest and color. 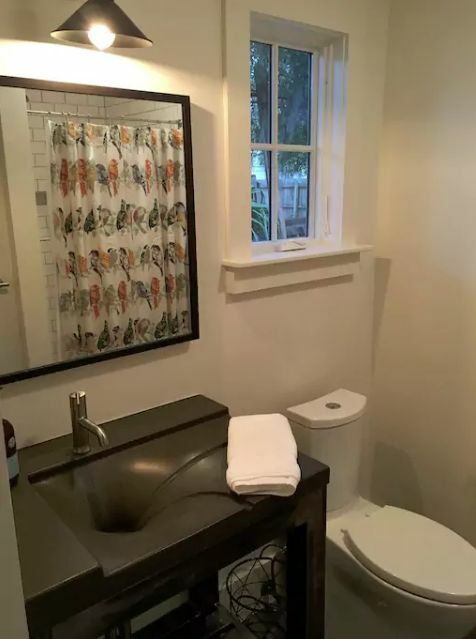 The bathroom features a unique stone-top sink and a whimsical bird-pattern shower curtain. A window helps brightens the small room.